The BTD-200 Lightning Warning System is a complete, out-of-the-box, self-contained sensor that reliably detects the presence of all forms of lightning to a range of 35km. The BTD-200 lightning warning system is a complete detection and warning system which has been developed from the Biral range of professional, aviation grade lightning detection systems. It reliably detects the local presence of all forms of lightning out to a range of 35km (22 miles) from the sensor. 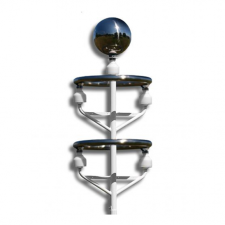 Designed to be installed and set up by non-specialist contractors, it comes complete with a power supply for the detector and the essential PC application – Lightning Works – for monitoring and warning of approaching thunderstorms. Complete, out-of-the-box warning system with minimal installation. (Power and data cables available separately). The BTD-200 uses quasi-electrostatic measurements to avoid the problems associated with the detection of lightning using radio waves and to provide the ability to issue warnings prior to the first discharge of lightning. Virtually all commercially available lightning detection sensors and systems use the reception of radio waves generated by lightning discharges as the primary detection technique. Whilst providing a sensitive method of detection there are many other sources of radio waves such as arcs from electrical equipment, vehicle ignition systems and fixed or mobile transmitters which can result in high false alarm rates. Standalone radio based lightning detectors such as electric field mills and radio frequency detectors often employ secondary measurements such as optical flash detection in an attempt to reduce false alarms and employ complex signal analysis to estimate range. These techniques are only partially effective, giving these older technology lightning detectors a poor reputation due to their high false alarm rate and poor distance accuracy. In many applications the lightning warning system is used to help protect people and equipment from the dangers of a lightning strike by providing advanced warning of a storm’s approach. This is all the more important in areas where large numbers of people are outdoors across a wide area enjoying a leisure activity (e.g. a golf course). Detectors which rely on lightning detection alone are only effective if the storm is already producing lightning at some distance before moving closer towards the detector. If the first lightning strike of the storm is overhead then these other systems can give no advanced warning and therefore no protection. 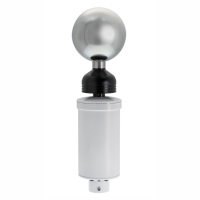 The advanced detection principle of the BTD-200 enables it to monitor the strength of the local electric field and the presence of charged precipitation, both of which are strong indicators of lightning risk. This allows the BTD-200 to provide warnings of the risk of an overhead strike even before any lightning has been produced. This advance warning can be up to 20 minutes before the lightning begins, giving more than enough time to alert staff, members, teams and the public to the risks of remaining out of doors. There are many applications where the ability to reliably warn of the presence of thunderstorms can increase both safety and productivity. The leisure industry must consider the risks posed by thunderstorms to both customers and staff at outdoor events whether they are concerts, theme parks, sports stadia or golf courses. Reliable thunderstorm detection allows these operations to take the appropriate safety precautions only when necessary, protecting both life and revenues. The BTD-200 lightning warning system is a modular system which is designed to operate out-of-the-box, but is also expandable as requirements grow or change. 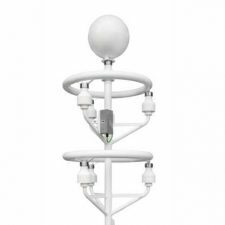 The essential system comprises of a lightning detector which is placed outside, either on a tripod mount or permanently installed, whilst a PC located indoors runs the supplied Lightning Works software. The system includes a power supply and (optionally) the cabling to connect to the power and the host PC.